Launched in 2016, Breeze founded and directs Instar Lodge, an unusual and spectacular artists space. Instar Lodge is situated in the charming hamlet of Germantown, New York, in a historic Odd Fellows hall. Its mission is to inspire creativity, courage, and community through the arts. Instar offers provocative and inspiring programing to the community with a focus on supporting women and mother artists. Learn more at www.instarlodge.com. An ongoing public-art project that maps individuals unique experiences with solitude in nature through their personal digital uploads and hand-drawn and written responses, Wayfinding Story began October, 2016 at Olana State Historic Site in Hudson, New York. Wayfinding Story was funded by a de-centralization grant from the New York State Council on the Arts administered through the Green County Council on the Arts, with matching support from the Olana Partnership and Olana State HIstoric Site. Learn more here: www.wayfindingstory.com. Breeze posted these three question as an anonymous online survey in the spring of 2015. 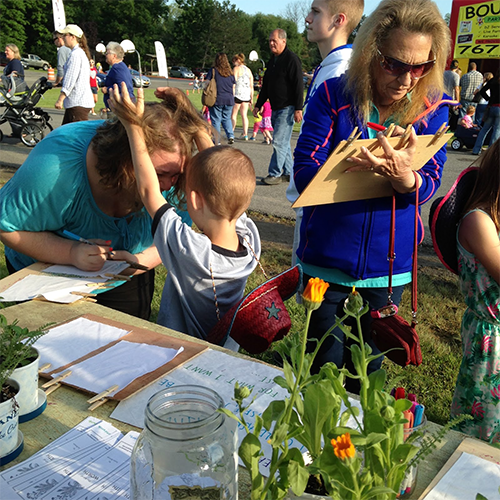 The surprising answers prompted a social artwork that included collaborating with an herb farm, growing and giving away medicine plants, gathering hundreds of in-person responses, and planting healing gardens. Learn more here: http://dreamsgrow.blogspot.com/.